When Should You Get Your First Credit Card? The path to financial adulthood is paved with lots of important milestones: getting your first car, moving into your first apartment, paying your first bill. All of these are major steps towards developing a healthy and independent financial life, and each should be treated a serious endeavor. Along with all the other big monetary strides you’ll have to take as a young adult, another crucial move you’ll have to make to secure your financial future is getting your first credit card. However, unlike paying your first bill or getting your first set of wheels, obtaining a credit card doesn’t necessarily rise from an immediate need. This makes it slightly more confusing to many emerging adults – mostly, they’re unsure when it’s the right time to make the leap to using credit over cash or debit. It’s important to note that, in theory, the best time to get a credit card is as soon as possible. This is because a significant portion (15%) of our credit score is determined by the length of our credit history, which means that beginning to establish a credit history as soon as we can is essential to our future ability to accomplish a host of financial tasks. However, we don’t live in the theoretical world, we live in the real world, and for a lot of people the real world can be financially messy. This means that getting a credit card as soon as we’re “officially” able to isn’t right for everyone. 1. Do I have a regular source of income? Being able to use a credit card responsibly hinges on your ability to be able to pay back your charges at the end of every month; this, of course, hinges on the cash you have coming in every month. If you have a reasonable and regular income, it might be a good time to try to get your first credit card and start building your credit history. If not, it’s probably best to hold off – you don’t want the temptation of tons of available credit with little available income to constantly be something you have to contend with. 2. Do I have a solid track record of money management? A very important indicator of how you’ll deal with having your first credit card is how you’ve dealt with money in the past. 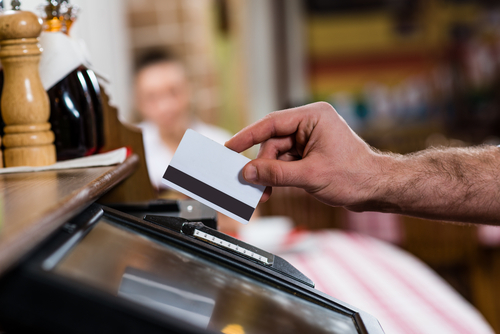 Obviously, we all learn and grow with time, but if you have a really dicey history with money, you may want to get some of those issues straightened out before you take on the responsibility of managing a credit card. For example, if you’ve ever…. …then you might want to put off getting your first credit card until you have a better grasp on your cash. On the other hand, though, if none of these money troubles sound familiar you might be ready to jump into the credit game. 3. Do I REALLY understand how credit cards work? Despite their ubiquity, credit cards are complicated financial products, so before you get your first piece of plastic it’s important that you understand exactly how it works. For example, do you know what a grace period is? What APR means? What about fees to look out for, do you know what those are? If none of this sounds familiar you should definitely spend some time boning up on your credit card knowledge before obtaining your first card. But if you’re feeling confident that your grasp on how credit cards function is up to snuff, it might be time to apply for your first card. Getting your first credit card is a big responsibility, but it’s an important step towards building a positive financial future. Figure out if you’re ready for your first card using the questions discussed above and get started with building your credit as soon as you can!